Please, see the instruction below for nominating qualified candidates for the first two awards. The nominations will be reviewed by a selection committee consisting of previous award recipients and the NAMBE Advisory Board. We are now accepting nominations for the 2018 MBE Innovator Award and the NAMBE Young Investigator Award. The deadline for accepting nominations is June 30, 2018. The award consists of a plaque and a check of $3,000. E-Mail this nomination form and supporting materials by the deadline to the Awards Contact above. Pallab Bhattacharya is the Charles M. Vest Distinguished University Professor and the James R. Mellor Professor of Engineering in the Department of Electrical Engineering and Computer Science at the University of Michigan, Ann Arbor. He received the M. Eng. and Ph.D. degrees from the University of Sheffield, UK. 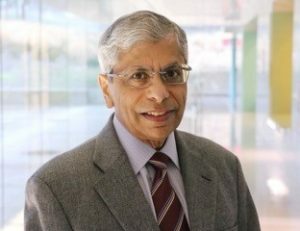 Professor Bhattacharya was an Editor of the IEEE Transactions on Electron Devices and is Editor-in-Chief of Journal of Physics D. He has edited Properties of Lattice-Matched and Strained InGaAs (UK: INSPEC, 1993) and Properties of III-V Quantum Wells and Superlattices (UK: INSPEC, 1996). He has also authored the textbook Semiconductor Optoelectronic Devices (Prentice Hall, 2nd edition). His teaching and research interests are in the areas of compound semiconductors, low-dimensional quantum confined systems, nanophotonics, spintronics and optoelectronic integrated circuits. He is currently working on high-speed quantum dot lasers, nitride-based visible quantum dot lasers and LEDs, nanowire heterostructures, cavity quantum electrodynamics and polariton lasers. Bhattacharya is a member of the National Academy of Engineering and he has been awarded the D. Eng. (honoris causa) degree by the University of Sheffield, U.K. He has received numerous professional awards including the John Simon Guggenheim Fellowship, the Heinrich Welker Medal, the IEEE David Sarnoff Award, the IEEE (Nanotechnology Council) Nanotechnology Pioneer Award, the Optical Society of America Nick Holonyak Award and the TMS John Bardeen Award. He has also received the S.S. Attwood Award, the Kennedy Family Research Excellence Award, and the Distinguished Faculty Achievement Award from the University of Michigan. He is a Fellow of the IEEE, the American Physical Society, the Institute of Physics (UK), the Optical Society of America, and the National Academy of Inventors. The North America MBE Advisory Board is proud to establish the Young Investigator Award to recognize individuals who have made significant contributions to the science and technology of MBE or enabled by MBE by the age of 40 and show promise of future leadership in the field. The award shall consist of a plaque and a check of $1,000. The deadline for accepting nominations is June 30, 2018. The NAMBE Advisory Board will manage the Young Investigator Award. It will be responsible for soliciting and evaluating the nominations and for final selection of the award recipient. Paul Simmonds, Boise State Univ. Paul Simmonds completed his Ph.D. in semiconductor physics at the University of Cambridge, where he worked with Dave Ritchie and Mike Pepper. His research focused on the MBE of III-V semiconductor 2D electron gases and nanostructures for studies of carrier transport in low-dimensional, world-record mobility materials. Paul moved to the US in 2007 to work as a postdoc, first with Chris Palmstrøm at the University of Minnesota / UCSB and then, from early 2009, at Yale with Minjoo Larry Lee. Paul’s research at Yale was chiefly based on his discovery that by using tensile strain it is possible to create III-V quantum dots on (110) and (111) surfaces, with potential significance for the fields of quantum computing and spintronics. From 2011 to 2014, Paul managed the Integrated NanoMaterials Laboratory at UCLA. Working with Diana Huffaker, Paul oversaw research on two interconnected MBE tools configured to grow a range of different semiconductor materials for electronic and photonic applications. Paul was also Chair of the IEEE Photonics Society, Los Angeles Chapter. 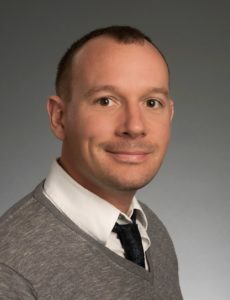 Paul joined Boise State University as Assistant Professor in October 2014, with a joint appointment in Physics and the Micron School of Materials Science & Engineering. He is a Senior Member of the IEEE, and an NSF CAREER Awardee. Two will be given based on the quality of the presentations, either oral or poster, made at the Conference. The student awards will be judged by a selection committee consisting of Program Committee members and Advisory Board members at the 2018 NAMBE Conference. The awards consist of a plaque and a check for $500.